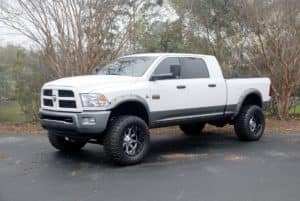 When you’re looking for a new pickup truck, you need to know what kinds of things you’ll be doing with the truck so you can choose a model that fits your needs. Since a truck is a utility vehicle, it’s important to make sure you get one that can handle the tasks you want to tackle, such as hauling and towing. Here are four steps to help you buy the perfect pickup truck. There’s a range of uses for a pickup truck, from occasional hauling to everyday heavy-duty towing. There are light-duty, medium-duty, and heavy-duty pickup trucks for you to choose from. If you need to haul smaller loads like landscaping equipment for a small crew, furniture, or other items, a light-duty truck fit the bill. Light-duty pickup trucks can haul a half-ton, while heavy-duty trucks are rated for three-quarters of a ton to a ton of payload weight. Decide on whether you need a two-wheel drive or a four-wheel drive. Will you need a four-wheel drive truck for extra power and control in slippery conditions like boat ramps? Another decision you have to make is what bed size you need. Pickup truck beds can be short, standard, or long, so you should think about what kind of space you need for hauling. One thing to think about with a long-bed truck is whether it will fit in your garage. Make sure you get a truck with the towing capacity you need. The engine and axle ratio determine how much weight you can tow. It might make sense to buy a truck with more towing capacity than you need, so you have the flexibility to handle future equipment upgrades and unforseen situations. Your gas mileage will be affected by the engine and axle ratio, so it’s more economical to choose a truck that closely matches your towing needs. Another important decision to make is whether you want a regular cab or an extra or extended cab. If you have a small work crew that you want to transport, then you want a cab that fits up to four people. Likewise, if you need the truck to double as a family vehicle, an extended cab is probably for you. If you only work solo or with one partner, and you don’t have to think about an impromptu carpool, then you probably only need a regular cab. Extra cab room adds to the price, but the flexibility may be well worth the price. Finally, you can get a lot of comfortable, convenient features in a truck that makes your work day a lot more pleasant. As with choosing a new car, you have the choice of several trim levels. It’s best to have an idea of what features you really want, such as a navigation system. When you’re looking for a new pickup truck, follow these four steps to decide on the perfect truck for your needs.